That's a ton of guys. Time for a bigger locker room and bus (maybe a track?). Too bad that Cheserek guy never chose UP. Dang. Also, cool to see some national reach by getting guys from South Carolina and Florida. UP will always be a team of mostly PNW guys, which is cool, but it's nice to have the ability to recruit all over. 2014 UPXC- best team ever? LRC thinks so. UPMXC moves up to #5! Not sure who did or did not run, but this doesn't sound good. "The men’s race featured five of the top-10 teams in the current national rankings, and nine top-30 teams overall. Last year’s NCAA runner-up, Northern Arizona, came through with the win on the men’s side, scoring 62 points to finish just ahead of 21st-ranked UCLA which had 72. No. 6 Stanford was third with 92, No. 14 Virginia led early and finished fourth with 112, then No. 26 Oklahoma in fifth with 129 and the Huskies with 152. Washington was one point better than ninth-ranked Villanova, and also ahead of No. 7 Indiana and No. 5 Portland." Looks like some of the top guys were held out....? Early results show Portland 4th behind 'Cuse, Iona, and Wisco at the Wisconsin Invite today. That field was essentially a who's who of the top 25. MADISON, Wisc. --- The No. 5 Portland Pilots men's cross country team finished fourth at the Wisconsin Invitational on Friday morning at the Thomas Zimmer Championship Cross Country Course. The Pilot's were led by senior Scott Fauble who placed fourth overall in the 8k race with a time of 23:52. No. 6 Syracuse won the meet with a team score of 86, No. 14 Iona placed second with 154 points, in third was the home team No. 9 Wisconsin with 176 points, and then No. 5 Portland finished with 211. Of the 254 harriers that competed in the meet, seven were Pilots. William Kincaid came in second for Portland with an overall finish of 16th and a time of 24:06 and he was followed by Reid Buchanan (19th, 24:06), David Perry (65th, 24:26), Timo Goehler (107th, 24:42), Danny Martinez (122nd, 24:48), and Alex Dillard (160th, 25:05). Wow. Terrific result for the pilots. DTLegend wrote: That field was essentially a who's who of the top 25. Yea. Couple seconds could have switched the score up quite a bit. Not sure we would have enough to catch Wisconsin though. Luckily nationals is a 10k, I think our guys are only going to be better over the longer distance. Via Twitter I'm seeing the men won the WCC title again, taking 1st, 2nd, and 4th in the race. 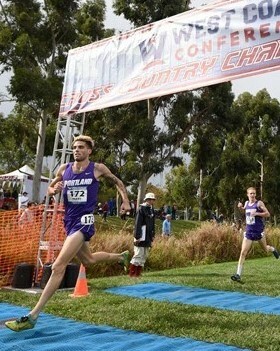 PurplePrideTrumpet wrote: Via Twitter I'm seeing the men won the WCC title again, taking 1st, 2nd, and 4th in the race. ....and the women's team came in second to BYU, but UP senior Tansey Lystad set a personal record winning the women's race. Looking at the results, the men's race must have been as about as exciting as a X-C race can be....12 of the first 14 runners were from UP or BYU. Congratulations to Coaches Rob Connor and Ian Solof and all those skinny student-athletes. Makes the math pretty easy. Hard to beat a 1,2,4 punch! Men second at regionals behind the *ucks. I know Cheserek was a recruit at UP, wasn't Korolev also? Dang. 1.3 seconds divides the top 6 runners. Pilots only 11 points (71 vs 60) behind 1st place UO, and 26 points (71 vs 97) ahead of 3rd place Stanford. Oregon's 5th man was 20th place, Pilots' 5th man was 34th. And Portland has been running without Ryan Poland, our 3rd place finisher at Nationals last year. Not sure if he will be fit enough to run next weekend, but if so... watch out! Portland could be in the mix for a podium spot. Also, UP is hosting a watch party for NCAA nationals in the HOF Room next Saturday: Women's race at 9AM (UP's Tansey Listad qualified as an individual - an awesome accomplishment!) and the men's race at 10AM. HOLY COW! Initial results show the Pilots MXC team finishing 3rd at the National Championship behind CO and UO!!!!!! PilotNut wrote: HOLY COW! Initial results show the Pilots MXC team finishing 3rd at the National Championship behind CO and UO!!!!!! Still waiting for official results, but I believe UP finished well ahead of UO....and Stanford was 2nd behind Colorado. I got a little excited as I was watching all the purple crossing the finish line, so I may have mis-spoke. UO claimed the individual title (and their runners finished 1 & 2), but you are probably be right. CO and Stanford were 1 & 2 late in the race. Initial results show Colorado in first, Stanford 2nd, Portland 3rd, NAU 4th, Syracuse 5th, Oregon 6th, Villanova 7th, Iona 8th.